It wouldn’t be October without adding another pumpkin recipe for you to make, drool at, Pin, bookmark, dance with, rub all over your face and generally just jump up and down for everything pumpkin. Ok, that didn’t make a whole lot of sense, but you get the idea and that’s what matters. People be pumpkin crayyyzy come fall. Once October hits I’m pretty sure that it breaks the internet, particularly Pinterest and Instagram. Sorry Kim K. but you ain’t got nothing on the pump’. On the backend of my blog they’re always the most popular recipes this time of year. 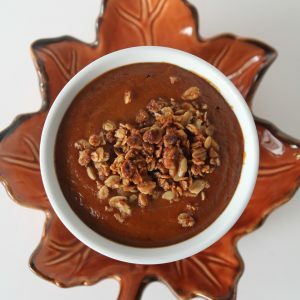 In fact, you can check out my Pumpkin Pie Smoothie or Pumpkin Custard to help squash that craving. But now I also have THESE little bites of autumn love to offer you. 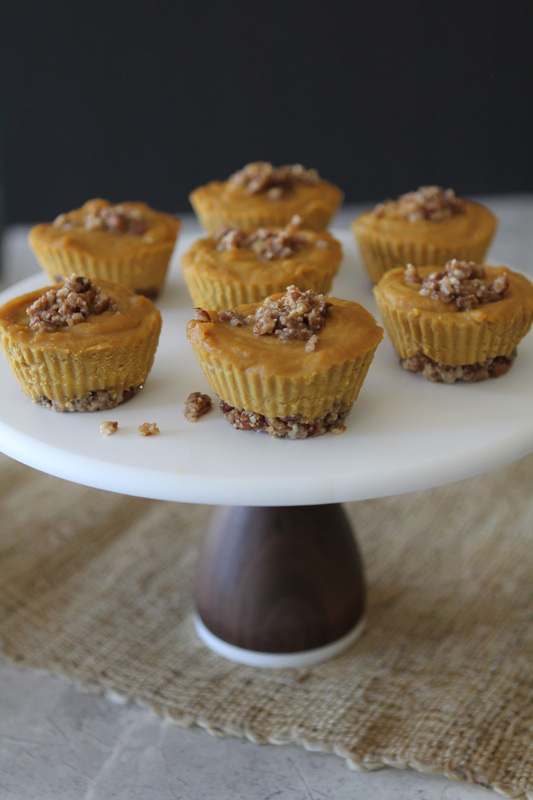 They actually taste like little bites of pumpkin pie and are really satisfying. And! They’re no-bake. AND they’re egg-free. How ’bout that? In fact, I don’t use a ton of sweetener at all in them but you’d never know based on the flavor. I’d say it’s the ultimate snack / treat to get you through the season. I suggest you use silicon baking cups for these so that they pop out easily. I’ve never used paper baking cups so I can’t testify to how easily they will come out but I’d imagine they might stick a bit for you. 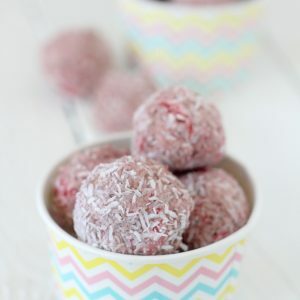 As for other tips on this recipe? I can’t say I really have any as it is just THAT easy. A dairy-free, egg-free no bake pumpkin pie bite. It's even vegan! Get your pumpkin pie on! Wow these look awesome- and I’m not even a huge pumpkin person! Question: if I am at the store looking for cacao butter, is cocoa butter the same thing? Any brand recommendations? Thanks!! Yes! There is a difference. You will want to make sure to use the cacao butter for cooking. I’ve used several brands and they have all been great! You can usually find it at any natural food store including Whole Foods Market. Excited for you to make these! I used regular sized silicon baking cups. I’m planning to make mini ones soon as well… as soon as I get my hands on some mini silicon cups. I highly recommend using the silicon ones to they “pop” out easily. 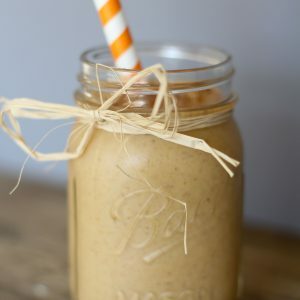 Two questions – is coconut butter the same as coconut oil (or can I sub) and can I sub almond or sunbutter for the cashew butter? Not that I’m opposed to cashew butter butvwe usually have the others in the house. Thanks! Can’t wait to try these! Nope, they are two different things. Coconut butter is creamier, more like a nut butter when melted. Coconut oil will give it a totally different texture. Enjoy! Are these pretty delicate or would it be worth attempting a full sized pie? I have the ingredients on my shopping list. So excited to try these! They are fairly delicate but I’m thinking a pie would actually work! I’d just add a tablespoon or two of extra coconut butter or maybe a tablespoon of coconut oil to help it firm up a bit more as it chills. Keep me posted if it works! I might have to try it out myself! 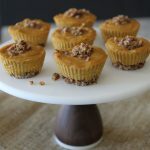 Thank you so much for an egg-free, dairy-free pumpkin recipe! Now, off to the store so I can make these ASAP! Blessings! You are SO SO welcome! Will these still work if I don’t use cocoa butter? Yes, but it will have a slightly different consistency. I made these as pumpkin “squares” for Thanksgiving and they came out great! I didn’t want to take the time to make each cup, just wanted to use one big rectangle pan (9×13? )… also needed to serve 15-18 people. In order to cover the pan, I tripled the pecan “crust” portion of the recipe… and then doubled the “filling” PLUS an additional 2 TBSP of coconut butter to firm it up.